About our modular nursery project, for workers of the Hospital Rey Juan Carlos I hospital in Móstoles, the Journalist Anatxu Zabalbeascoa talks about one of our most representative projects of ENERO. 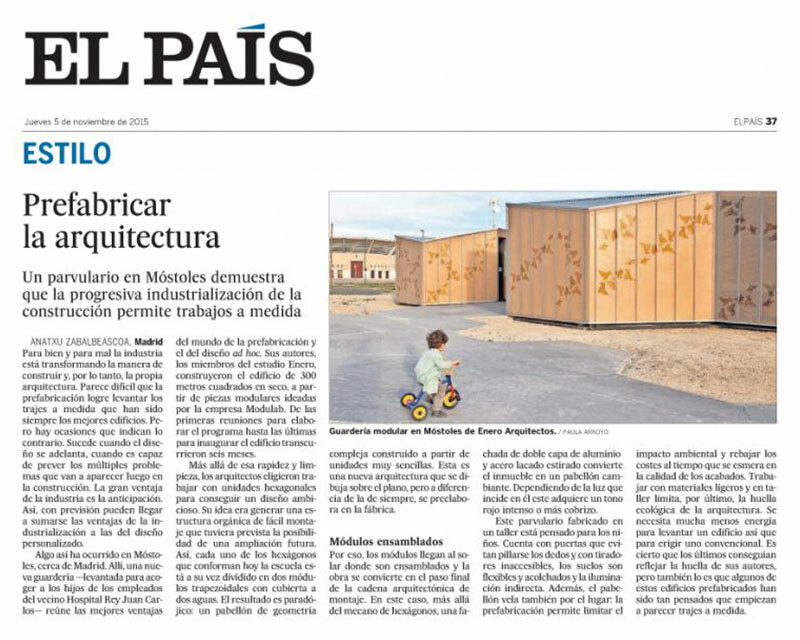 In the words of the Journalist: “A kindergarten in Móstoles shows that the progressive industrialization of construction allows tailor-made works”. 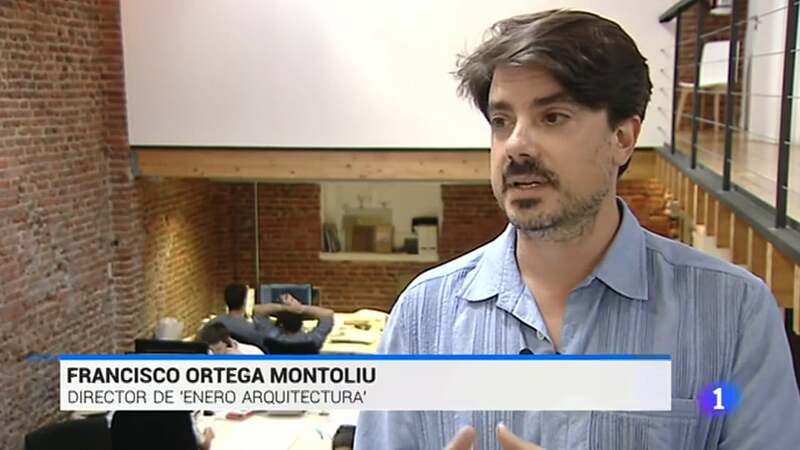 On the occasion of the collapse of the building on General Martínez Campos St., TVE 1 interviewed our CEO, Francisco Ortega Montoliú and Jorge Sánchez Iglesias, to discuss the complexity of undertaking rehabilitation works and the pathologies of buildings over time. 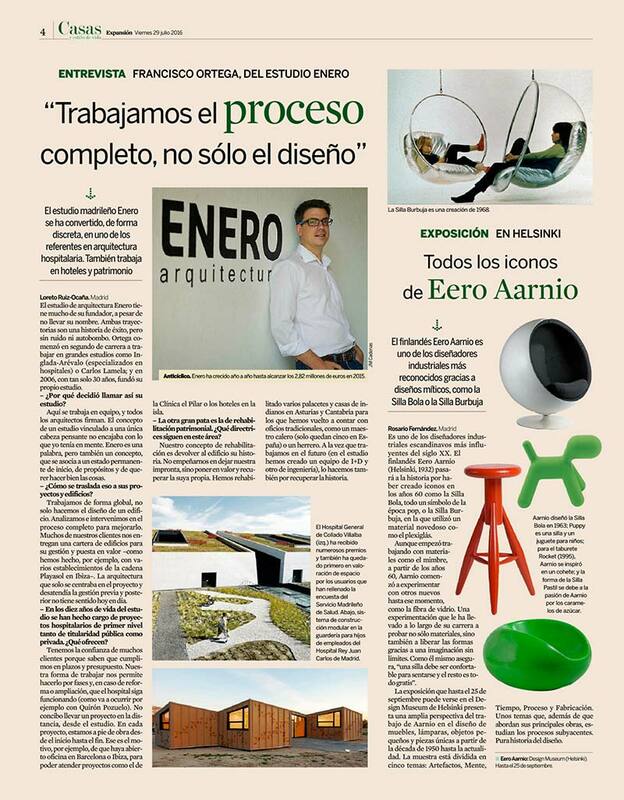 The newspaper Expansión, thanks to the journalist Loreto Ruiz-Ocaña, interviews Francisco Ortega, CEO of Enero Arquitectura, about the work done in Enero Arquitectura regarding the integral process of the work. Francisco responds on the page dedicated to lifestyle supplement Casas y Vida that is launched every Friday in one of the largest economy newspapers in our country. Publication of the press release on the work executed in 2017 by Enero in Spain. The digital version of Alimarket magazine echoed the increase of 155% in works execution. 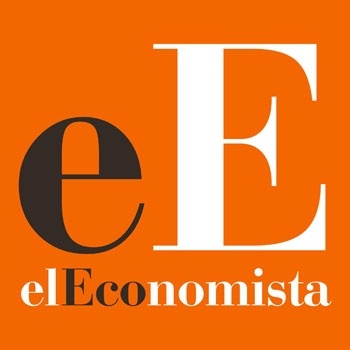 Interview with our CEO, Francisco Ortega, in the largest newspaper in Asturias: La Nueva España. In the interview he is asked about the importance of patrimonial rehabilitation. Press release distributed in Europa Press about the participation of our studio in the Intergift fair of 2016. Article in the magazine 20 Casas on one of our projects, the industrial loft. Article on the page of the association World Health Design that delivered in 2013 the Highly Commended Prize to our hospital project of Collado Villalba. The newspaper of Ibiza echoes the advances in the area of patrimonial rehabilitation carried out by Enero. Story on the modular kindergarten built by Enero around the Rey Juan Carlos Hospital in Móstoles. Story on the agreement to reform hotels with Playasol on the island of Menorca. Agreement of Beatriz Pérez as CFO of Enero. Agreement of Ismael Domínguez as Engineering Director of Enero. Presentation of the Ciudad Real hospital project to the journal of the Hospital de Albacete. Presentation of the day of Modernization and Rehabilitation of Health Centers, run by Grupo Vía in Madrid. Agreement of Ignacio Sánchez as Director of Management of Enero. We want to know your opinion. If you want to get in touch with us, we leave you our information and, on the right, a form if you prefer to write us.